For years, I drove a Mercedes-Benz. I owned different models ranging from four to eight cylinders so I was accustomed to fuel being a significant monthly expense. About two months ago, my mother and I went to lunch to with a like-minded friend and I got my first glimpse of an EV charging station, as he was charging his Nissan Leaf at the Mandalay Bay Mall. Parked next to him was a Chevy Volt, charging as well. 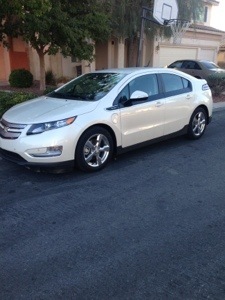 Living in the “City of Sin” and excess, I’d never seen a Volt in person before, as these cars are pretty rare (for now). Never before did I seriously consider getting a hybrid-type vehicle. They seemed like toy cars by comparison to mine. In my opinion, a fully electric vehicle would be ideal, but they require lengthy stops to recharge if taking a long trip. A Volt had the best of both worlds: plug-in capabilities for general daily commutes and a gas engine if needed for 300 plus mile trips. It was then I made up my mind to give this car a chance. My brother-in-law, Travis was the first person I called. He works at Fairway Chevrolet in Las Vegas, so I asked him what he thought of the Volt, half expecting him to say, ‘eh, it’s so so.’ What he told me was, ‘I love this car!’ This is a guy who, like so many Americans (myself included), have been seduced by the power of big gasoline engines. He said to come on down and drive one. The torque from the electric drivetrain was far more than I expected. This car really moves. I even test drove it far enough for it to switch from electric to gas, and noticed no change in the handling. I was sold. Thankfully, I was lucky enough to land exactly the model I wanted thanks to Travis’ exhaustive search on my behalf. Zero percent financing helped seal the deal. So I’ve been driving mine for over five weeks and I’ve used 2 quarts of gas! With a great safety rating along with the sensors that keep me driving perfectly, my fears of “downgrading” from German engineering were allayed. I’m certainly ashamed of my reluctance to go green for so long. I suppose getting 2,500 miles to the gallon will do that to you. Thanks to the Auto Bailout in 2009, I can drive a car with great technology, made right in my own country. My power bill increased by around $30 which is a mere pittance to the $300 per month I was spending on toxic fuel. This amount would virtually disappear if I had solar power. After all, Las Vegas has an insane amount of sun (and wind) and the fact we are not more like Germany who powers 20% of their country by harnessing solar energy is shameful. Imagine if we were more progressive and utilized our vast sunshine, perhaps stored energy could save hurricane-ravaged areas which would suffer inevitable power losses no more. Maybe if Reagan hadn’t removed the solar panels put on the White House by President Carter we’d use more renewables rather than importing hostile nations’ petroleum, which truly is environmental poison. Now that Hurricane Sandy has impacted so many Americans, perhaps President Obama can focus on climate change issues once again. I knew I had experienced full-fledged Gasophobia this morning when I recalled my disturbing dream: I had to actually fill up my car at a gas station. Somehow I managed to duplicate the scene in Dumb and Dumber where I drove a significant distance in the wrong direction. To make matters worse, no one would let me plug in my car. I actually woke up slightly agitated over this “nightmare” that I would never have had in the past. It really is pretty funny, but pretty awesome at the same time. Hopefully this trend will catch on and we can save our coastlines from devastation due to man-made global climate change. I’m now a faithful convert to green technology.